In this special lesson of Coffee Break German, we’re challenging you to identify five personalities by using the German skills you’ve acquired in the courses so far. In this new lesson in our series you’ll learn to talk about likes and dislikes in German. Coffee Break German comes to you from the Radio Lingua Network. In weekly episodes you’ll join native speaker Thomas who’ll be teaching learner Mark in gradual, structured lessons. The episodes also feature Kirsten, our Grammar Guru, and Julia, our Cultural Correspondent. In this lesson you’ll learn to talk about birthdays and jobs with your new German-speaking friends. Coffee Break German comes to you from the Radio Lingua Network. In weekly episodes you’ll join native speaker Thomas who’ll be teaching learner Mark in gradual, structured lessons. The episodes also feature Kirsten, our Grammar Guru, and Julia, our Cultural Correspondent. This lesson focuses on using the phone in German. Coffee Break German comes to you from the Radio Lingua Network. In weekly episodes you’ll join native speaker Thomas who’ll be teaching learner Mark in gradual, structured lessons. The episodes also feature Kirsten, our Grammar Guru, and Julia, our Cultural Correspondent. Half way through the course! In this twentieth lesson of Coffee Break German you’ll join Mark as he is tested by Thomas on everything he has learned so far in the course. Coffee Break German comes to you from the Radio Lingua Network. In weekly episodes you’ll join native speaker Thomas who’ll be teaching learner Mark in gradual, structured lessons. In this latest episode of Coffee Break German you’ll continue learning to deal with public transport in German. Coffee Break German comes to you from the Radio Lingua Network. In weekly episodes you’ll join native speaker Thomas who’ll be teaching learner Mark in gradual, structured lessons. The episodes also feature Kirsten, our Grammar Guru, and Julia, our Cultural Correspondent. In this week’s episode of Coffee Break German you’ll be learning to talk about public transport. Coffee Break German comes to you from the Radio Lingua Network. In weekly episodes you’ll join native speaker Thomas who’ll be teaching learner Mark in gradual, structured lessons. The episodes also feature Kirsten, our Grammar Guru, and Julia, our Cultural Correspondent. In this latest episode of Coffee Break German you’ll be learning to deal with shopping situations in German. Coffee Break German comes to you from the Radio Lingua Network. In weekly episodes you’ll join native speaker Thomas who’ll be teaching learner Mark in gradual, structured lessons. The episodes also feature Kirsten, our Grammar Guru, and Julia, our Cultural Correspondent. In this latest episode of Coffee Break German you’ll be taking your German skills a stage further. Coffee Break German comes to you from the Radio Lingua Network. In weekly episodes you’ll join native speaker Thomas who’ll be teaching learner Mark in gradual, structured lessons. The episodes also feature Kirsten, our Grammar Guru, and Julia, our Cultural Correspondent. In this week’s episode of Coffee Break German you’ll learn more language for ordering food and drinks in cafés. Coffee Break German comes to you from the Radio Lingua Network. In weekly episodes you’ll join native speaker Thomas who’ll be teaching learner Mark in gradual, structured lessons. The episodes also feature Kirsten, our Grammar Guru, and Julia, our Cultural Correspondent. 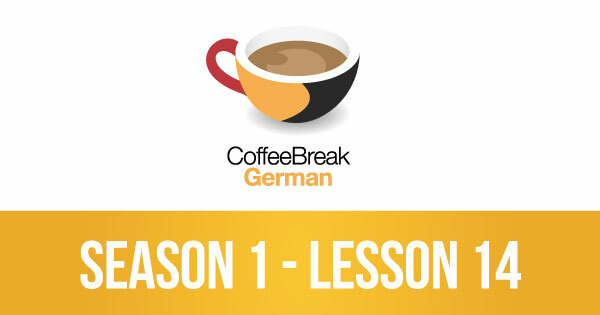 We’re back with a new episode of Coffee Break German, the first in a new season of ten lessons which focus on practical German you’ll need on a trip to a German-speaking country. In this episode you’ll be learning to order drinks – and coffees – in a café. Coffee Break German comes to you from the Radio Lingua Network.